MUMBAI: Dhruv Ghanekar, one of those behind the path breaking blueFROG, Mumbai, is making waves with his tunes across the country over a decade now. Honest and straight from the shoulder, that's how one would describe him. The self-proclaimed ‘gear junkie’ recently performed at Paddy Fields Festival on 16 October (2016) and in Bacardi Nh7 weekender at Shillong on 22 October (2016). In a conversation with Radioandmusic.com, he shared his music inspirations, musical distinctiveness, his method to fuse various styles in his music, his collaborations and upcoming projects. You have been in this industry for quite some time now and your music is experimental in its approach. How would you describe your genre? Progressive Indian Music. There you go! It’s catchy and perfectly sums it up. Though I hate labels, as they can be quite limiting, it’s a necessary evil. I think I am a musical schizophrenic; I love a lot of different types of music. Partially, this is due to my childhood years, even though I didn’t come from a musical family, my family enjoyed different types of music, my father on his trips abroad would buy the top 40 cassettes. My mother was into classical music and old Hindi film songs, ghazals and more traditional music. So, I landed up listening and absorbing a lot of different music between the age of 7-12. When I turned 13, I got turned on to Jazz music and that changed my world. The genre world music is vast, how do you fuse various elements and styles? I guess we are victims of our upbringing. Since I had such a wide musical exposure, my grown-up life has been trying to make sense of all these influences and organise it into one cohesive sound. I like the idea of fusing opposites. Mashing a culture against another that is diametrically opposite end of the spectrum. It’s challenging but when it works the results can be wonderful and surprising. ‘Dhima’, the song that I did with Ila Arun is one such example of fusing Rajasthani and West African blues. ‘Baare Baare’, which features Kalpana Patowary is another piece that fuses Assamese folk with a North African influence. How do you carry out the creative process? According to you, what is unique about your sound? If you say it is unique, I’ll take the compliment! (smiles). I guess it’s the juxtaposition of various cultures into a single sonic identity, that’s what is exciting for me. I spent a lot of time studying and playing purely single genres. However, eventually, you get to a point where you want to create your own identity. I guess that’s the mission that I am on now to create a modern Indian tapestry and present that to the world. Our Folk music is so rich and 100’s of years old and is timeless. Every country celebrates its own culture. In Spain – it’s Flamenco, In Brazil – its Choro and Samba and Bossa, and every African country has its own unique sound. I think in India due to the heavy marketing machinery of Bollywood, our culture has gotten sidelined. As an Indian musician and artist, I am determined to bring our folk culture to the foreground but in a modern avatar! Independent artists and the music scene are booming in India over time, how do you escalate that? I think it’s great, it’s very nascent, but it’s promising. We need certain infrastructural elements in place - venues, music schools, artist management, government grants, and lower entertainment taxes for the scene to flourish and eventually become mainstream. Your live shows are full of the oomph factor, how do you incorporate so many things altogether? I think again the whole endeavour is to keep it fresh and interesting for myself and to make the show unique so the audience feels that they were a part of something completely new and different from the last one. I also am grateful that I have such incredible talent in the band, Kalpana Patowary – who is just a ridiculously talented singer. A new member, Illa Straight who is from Philadelphia has just joined us is a rapper and MC who can improvise just like a jazz musician. Artur Grigoyan, who is an amazing saxophonist from Armenia and can play Balkan folk, Jazz, Funk and anything in between adds an international colour. Then there’s Rohan Rajadhyaksha, who’s a young and talented keyboardist who has recently come on board. It took you quite a long time to release your second album ‘Voyage', any particular reason that you want to share? How tough is it to be collaborating with so many different musicians? I got really busy between 2009-2013. I moved studios, finished three feature films and was swamped with advertising projects. Also, I was finding the right musicians to collaborate which took time. So, I traveled to France to record with Karim Ziad and Linley Marthe, getting their dates also took some time. The collaboration part wasn’t that difficult, just a logistical challenge. Most of the musicians heard the tracks and agreed immediately to come on board. Also, the mixing took about a year, due to my commitments. Since the album was totally self-funded and released on my own label Wah Wah Music, and since this was the first time that I had undertaken such an endeavour, a lot of decisions and tie-up’s took the time to close up. I also shot four music videos that had to be planned and shot and executed. What’s your take on the youth who are inclined to electronic and disco music? Do you think people are growing their musical knowledge over time? I think diversity is a good thing. It’s not necessary for everyone to have the same interests. It’s also naïve to think that all Indians have the same exposure. Someone who grew up in Chennai will have a different take on one thing. That’s what is amazing about our country, that there is some much diversity. We should celebrate it. If someone is interested in becoming a DJ, great, go for it. But learn music. It will only help in making the music richer. Bollywood conventional music takes the biggest piece of the pie and then comes regional music. How hard does it become being a music producer who incorporates sound for his originals to accomplish something? Back in the day, in Bollywood, the most successful composers were the ones who had their own unique sound and identity. Being successful and being original is not mutually exclusive. One has to still introspect and find oneself to create any music. We tend to be dismissive of successful people. But, everyone has their own arc and journey. If you are really talented you will run the 55 km marathon, if you are a fly by night guy, your career will be over after 100 m.
You have performed throughout the nation, and abroad too Which is your favourite venue? It will always be The Blue Frog, Mumbai. It was very close to my heart. Music influences you all would like to mention? Any favourite artist you’re currently listening to? This is currently on my playlist: Laura Mvula, The Roots, Coke Studio Pakistan – Season 9, Songhoy Blues, The Witch – Soundtrack, Band of Gypsies, Kaushiki Chakraborty – anything from her, she’s incredible and Mozart’s Lullabies, to put my kids to sleep (wink). As you are the man behind the path-breaking blueFROG; do you think it will be the unchanged after heading towards different location/s? Of course, it will be different. But, that’s life, change is inevitable. We had an amazing run at Lower Parel, Mumbai. However as it is with all good things, they have to evolve. I am a closet drummer. I actually love good electronica. I am a gear junkie. Having composed for a dozen Bollywood films and performed live at concerts across the globe from Norway to USA, Dhruv Ghanekar has worn many a musical hat with elan. 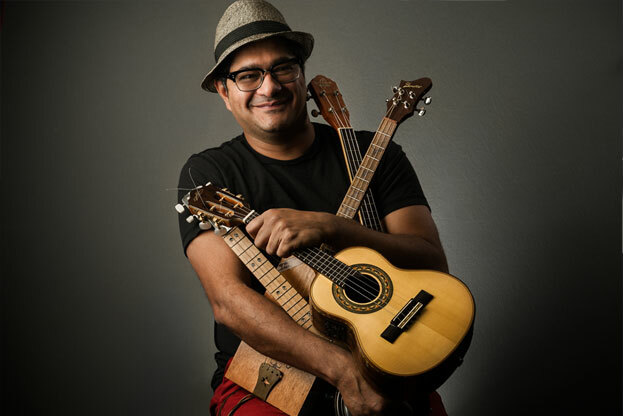 With virtuoso arrangements, peaceful orchestration and an ability to bridge Jazz and contemporary Indian sounds, Dhruv is a guitarist, musician and songwriter. The Mumbai-based artiste began studying Indian classical music from the age of nine. He went on to study under sarangi maestro Sultan Khan. His permanent love affair with the guitar began in school and in a few years, he founded the rock band Chakraview. The mid-90s 1996 saw the beginning of his working relationship with rock musician Ashutosh Phatak and they went on to become music-makers for ad films and alternative movies, with over 3,000 projects delivered to date. When you take time off for travel, you seldom want the journey to end. 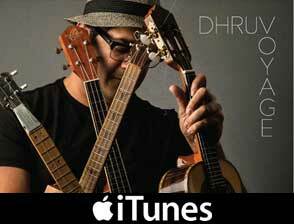 Guitarist Dhruv Ghanekar explains that mak­ing an album is no different. It’s no wonder then that his second album is named Voyage. “One of the problems with doing your own music is that you never actually finish it. You can continuously keep working on it; it’s one of those things,” says the composer, guitarist and singer, when we meet him at his record­ing studio in Khar. A dozen glistening guitars are neatly stacked in one corner and several hard-cased pieces of what looks like a large percussion set-up have just arrived, informs the staff, from Taufiq Qureshi’s group. Now that the album is done and dusted, Ghanekar looks relieved and stage ready even.